In case you're interested, here are a few pictures of our engagement rings. The first two pictures are Elaine's. This is a beautiful trinity with a high bar setting, all in white gold (her favorite). This ring was purchased from a wonderful salesgirl at G.M. Pollack's in downtown Bangor. She was the best David had talked with, and when she left Pollack's, so did we. The third picture is David's engagement ring. That's right, we're bucking tradition... why shouldn't the bride give a token of her love to the groom? 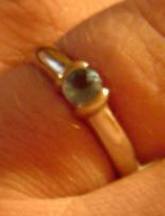 In fact, Elaine gave David this ring in August 2003, four months before he got hers. It's white gold (more towards the yellow side than the white) with a nice blue topaz in a flush setting. Read more about our view of the rings tradition here. These are on order. These wonderful comfort-fit bands by Novell Design Studio: their N'OVAL bands. The N'OVAL bands are curved in such a way that they feel really comfortable when you wear them. They don't have any sharp or thin edges. David generally can't stand wearing jewelry, but when trying these rings on, he loved them. 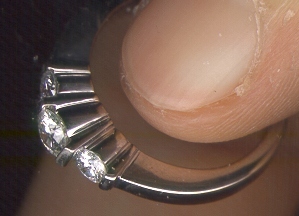 Lots of ring makers are coming out with this "comfort fit" style, and we both think they're well worth it. We chose to go with plain wedding bands in 14K white gold. We're both partial to white gold, and we both prefer 14K over the softer, higher-karat types. We're both wearing 4mm bands; David isn't going with a more typically wider band because he doesn't want to push his luck with the comfort issue (he doesn't like jewelry much), and Elaine didn't go with a narrower band because the 4mm better complements her engagement ring. We recommend anyone looking for wedding bands to check out Novell's N'OVAL line. Not only are they very reasonably priced, these comfortable bands offer a number of great features such as free refinishing and resizing for the life of the rings. You can visit Novell at www.NovellDesignStudio.com. 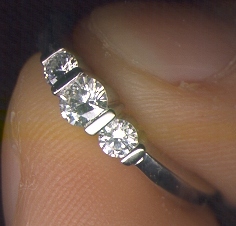 FYI, we bought our N'OVAL bands at Day's Jewelers on Stillwater Avenue in Bangor.